A pet sitter will come and meet you and your pet(s), in your home. 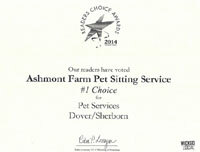 We will discuss your pet’s needs at this time, complete a service contract, and we will learn about your home. Key pick up will happen at this time. A bonded and insured pet sitter will come to your home to walk your dog(s). We will walk them on leash in a neighborhood, giving them a chance to sniff and explore. Walk can be individual if needed, but sometimes we may bring a compatible dog to walk with them. While we are at your home, we will give fresh water and a treat. We are happy to leave lights on for you if requested, and suggest a towel be left out for muddy paws. A bonded and insured pet sitter will take care of your dog(s) in the comfort and security of their own home. We will also check your home, alternate lights, water plants, collect mail, newspapers and packages, as well as put out trash for collection. A bonded and insured pet sitter will take care of your cat(s) in the comfort and security of their own home. A bonded and insured pet care provider will transport your pet to/from your veterinarian, groomer, or other destination within 5 miles of your home. Cats must be in a secure carrier, and dogs must be leashed. We will take your dog out for a bathroom break, give your pet fresh water and a treat and leave a note and any documentation.